Advocate an analytically-driven, engineered writing process. Obviously, this is one subject on which my wife and I disagree. Sometimes quite vehemently. And this is also an argument that I’ve seen writers manifest in the perennial debate over outlining, writing synopses, or just seat-of-the-pantsing it. That question, beloved of the interwebs, is bogus. For a story to be effective, it must be coherent on one or more levels. And coherence in narrative results from having a plan. If a story didn’t have an underlying plan, it would be stream of consciousness and word association. And while some few (*cough* James Joyce *cough*) may have pulled it off, most of us won’t. The real question is one of timing, worldview, and brain wiring. Let’s posit two (obviously extreme) writers: Jane Outline and John Pants. Obviously, Jane likes to map out the events of her story before sitting down to pen some prose. John, by contrast, sits down and lets his characters tell the story. Both John and Jane still execute on a plan. The real difference is when each prepares that plan. Jane, with her spreadsheets, notes, and color charts front-loads a great deal of the work. Before she writes her opening sentence, Jane knows what her characters will do at each stage of her story. She knows what motivates them, and how they will react to the situations she puts them in. For her, the act of writing is more a question of finding the words to best express actions that she has already mapped out. The events of her story will rarely surprise her, but her execution might. John, by contrast, sits down with a character, a voice, or a sentence. He has a hook that brings him into the world of his story, but beyond that he doesn’t know much of where the story is going. After he writes that first sentence, or the first paragraph, he lets the character/voice guide him. The story that unfolds might surprise him, though he counts on his facility for language to express that story as it makes itself apparent. If John has a plan, he makes it up as he goes: he knows what will happen in the next sentence, the next paragraph, or the next scene. But he might not necessarily have an end-goal in sight. His plan is gradually uncovered in parallel to the story. Both plans come from the heart of storytelling in our souls. Those of us wired like Jane might consciously try to tap into that wellspring, while those like John might have to negotiate access on a moment-by-moment basis. But if we want to write at a professional level, we need to develop the capacity to touch that heart of storytelling whenever we need to. Waiting for the elusive muse, or relying on some ritual, is counterproductive and inhibiting. And that is something that the Professor and I agree on. So how can writers – regardless of whether they plan ahead of time or not – develop the capability to build stories? While at its most basic level the answer is practice (or as the Professor tells me constantly: Just write, dammit! ), I think the more complete answer depends on how our brains are wired. I’m a fairly analytical fellow by both nature and training. I see patterns and systems just about everywhere (whether they’re really there or not). When I sit down to write, I try to think of it in terms of systems and processes. This isn’t to say that I write by the numbers, but I find that I will always try to build a conceptual framework around whatever writing project I’m working on at any precise moment. Sometimes, that conceptual framework manifests itself in an outline, other times in a synopsis, and sometimes (usually when I write short fiction) it stays in my head. But the quality of those conceptual frameworks, and the tools that I can apply to them are actually the result of critical theory and extensive analytical reading. I try to read as much critical theory as possible. And since I write primarily in the speculative genres, I also read heavily in genre theory. If your only exposure to critical theory has been Derrida (ick) or most of the other post-modernists, then I strongly suggest you take a look at some of the more formalist schools of thought: there’s a lot of value to be found there. I’ve found that useful critical theory expands my conceptual vocabulary, and gives me a way of thinking about story structure, character archetypes, and narrative techniques. Unlike how-to-write books or blogs (which can also be helpful), most good theory isn’t didactic. It’s diagnostic: it describes what the investigator sees in the field, rather than what a practitioner should do. Why is this helpful? It explains what other authors, schools of writing, or genres have done. If I’m writing a fairy tale, I find that I keep Vladimir Propp’s Morphology of the Folktale close to hand. Not because I slavishly stick to the plot constructions he describes, but because he has laid out a time-tested architecture for fairy tale storytelling. I might choose to diverge from his framework, but if I do so, I do so consciously: I know where I’m diverging and why. When I write fantasy, I keep in mind Farah Mendlesohn’s categories of fantasy (from her excellent Rhetorics of Fantasy ). Doing so does not limit my writing, but it expands my awareness of where my story might go. Analytical reading is a way of consciously constructing my own conceptual vocabulary. When I read a story, in particular when I’m reading something for review consideration, I’m always asking myself what techniques the author used to manipulate the reader’s perception. I examine their effectiveness, and the reasons driving it. In essence, I’m creating my own internal critical theory that then informs my writing and affects how stories get constructed in the deeper recesses of my brain. A big part of this blog is actually my attempt to further systematize this nebulous personal critical theory and deepen my conscious awareness of it through its articulation. Our theoretical John Pants (and The Professor, and a who’s who list of amazing writers) would probably disagree with everything I just said above. They would say that theory can be inhibiting, leading us to write by the numbers. And yes, this is a real risk. Just consider all of the dross produced on the back of the Campbellian monomyth. Instead, they would probably suggest that people should just read extensively and analytically, and write, write, write. And that is absolutely true. But extensive reading (whether consciously analytical or not) has the same ultimate effect as reading theory. Have you ever found yourself reading extensively in a particular time period, or genre, and discovered that you’ve picked up habits (sentence construction, pacing, plot) from your reading? Even if we don’t consciously dissect our reading material, the act of reading still builds our internal critical theory. Consciously, analytically, or through osmosis, the act of reading assembles our conceptual vocabulary whether we want it to or not. Whether we can ever consciously articulate that theory or not doesn’t matter: it’s still somewhere in our brains. And it percolates there, and then leaks out to flavor our writing. And the more extensive our internal critical theory, the wider assortment of narrative tools we have in our writing workshop. I admit, I’m not one of these instinctive writers. But I suspect the biggest challenge for such writers is to work through the moments in their writing when their limited conscious plan peters out. “Where do I take the story from here?” is a question I suspect many struggle with at some point. Which is why they say Broadway is paved with excellent first acts. The exhortation that writers force themselves to write, come hell or high water, is designed to train us to smoothly access our conceptual vocabulary – whether we’re conscious of the process or not. And the wider our reading, the broader and deeper that conceptual vocabulary becomes. This then lets us avoid such dead-ends, or to more easily identify them so we can backtrack to fix them. We writerly types are fairly idiosyncratic. Like athletes, we all have our little habits that put us in the zone. Whether it’s a particular chair we love to write in, or a particular time of day to write at, or a particular process that we go through before setting fingers to keyboard, we’ve all got our little rituals. And rituals are bad. They’re crutches that over the space of a career are just not sustainable. Because life generally is not conducive to ritualized work processes. Sooner or later, our favorite chairs break, mugs get lost, schedules get all mixed up. Life just gets in the way. And if we’re beholden to our rituals, then our writing will suffer. Imagine if John Pants lands a three book deal, with a national book tour (okay, I realize this isn’t likely in the modern world – but for illustrative purposes only, bear with me). He’ll be on the road for eight weeks plugging the first book in his trilogy, meanwhile his deadline for book number two is rapidly approaching (if it hasn’t already passed). If he’s addicted to his favorite writing chair, or to his cat lounging on his feet, he’s going to have a lot of trouble finishing book two while on tour. I find that I struggle with a variety of rituals in my writing. For example: when I sit down to write a short story, I like to write a complete draft in one sitting. Silly, but it’s just a little ritual or idiosyncrasy that I’ve got. Or if I’m working on a long form work, I like to write a complete scene, or a complete chapter. As far as rituals go, this isn’t that bad (the upside is I usually finish the stuff I start). But it still means there will be times when I decide not to write because I know I won’t have time to get far beyond a single sentence or paragraph. If I don’t have an hour or two to focus, I might just wait for later. And that’s an inhibiting habit that I’m working on breaking. It’d be nice to be able to write effectively at any time of day, whether I’ve got five minutes or an hour to do so. With the Professor’s exhortations (and mockery) I’m working through this, but it’s something that takes – and will continue to take – work. But there is a difference between ritual and process. Process is an outgrowth of how our brains are wired, and so if we need to write an outline to tell a story, then I say go for it! But we cannot let ourselves become slaves to that process. An outline is one process that is particularly suited to those of us with an analytical mindset. There are others (synopses, notes, mind-maps, and yes – even just winging it, etc.). If we say we absolutely need an outline to write, and then we get stuck in the outlining phase, that might mean our process has broken down for a particular project. If our process has become a ritual, we might get stuck. But if we have the flexibility to switch to a different process, the odds of bogging down fall dramatically. The last three long works I’ve drafted (one fantasy novel, one graphic novel script, and one alternate history novel) all used a different process. The first had a detailed outline before I ever started writing it. The second had a loose synopsis. And I winged the third until I got about halfway through it, then built a detailed scene-by-scene outline from there. Much as I like process, it can be a crutch. And here my wife’s aversion to analytical writing is dead on: At some point, crutches always break. Which is why having the widest possible assortment of processes in our writing toolkit makes good analytical sense. It is always good to push our own boundaries as writers, to play and experiment with different tools, techniques, and methods. So what processes work for you in your writing? What techniques would you recommend? What techniques have you tried that didn’t work for you? Why do we love science fiction, fantasy, or horror? Does anyone have a theory as to why science fiction and fantasy are so popular? Science fiction, fantasy, and horror are all marketing categories. They loosely describe a set of fictional conventions that can be expected within a given work. Does a story have robots? Odds are it is science fiction. Does it have magic? Most likely fantasy. Does it have undead monsters out to eat your flesh? I’d guess horror. Of course, this is a gross over-simplification. As a lot of my earlier posts on genre observations suggest, the reality is a heck of a lot more complicated. But your typical reader or movie-goer isn’t terribly concerned with the minutiae of genre theory (which I think is unfortunate, but I’m both nerdy and pedantic). Why do so many respond – in one fashion or another – to speculative storytelling? 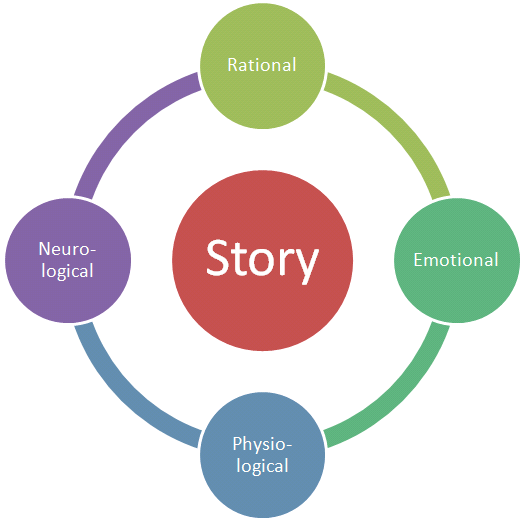 Experiencing a story affects us on both psychological and physiological levels. Have you read stories that put you on the edge of your seat? They tugged on your subconscious emotions to increase tension. That sensation of your palms sweating or your heart beating faster? The story, and the tension it engendered, elicited a physiological response. Or have you ever fallen into a story so lovely that the world around you and the passage of time faded into mere background noise? The story produced a neurological trance-state, not unlike meditation or hypnosis. Have you ever read a book and realized you might be wrong about something? The story’s rhetoric affected your rational thoughts and values. There’s a connection between our brains and our bodies that good storytelling can powerfully manipulate. It is simultaneously a positive and negative feedback system, where if a story affects one aspect of our beings it has ripple effects that impinge on every other aspect. When a creator manipulates this system skillfully, the effect is transparent and immensely powerful. And here’s why this is important: a story’s marketing category has no bearing on the audience’s response. That’s right. Whether we’re reading mainstream literary fiction, watching Blade Runner , or flipping through a comic book, our brains and bodies will still respond to the underlying story. When we participate in ludic reading (reading for pleasure), we are looking for a certain configuration of those four responses. Of course, we can’t possibly articulate what that configuration might be (I can’t imagine anyone looking for a story that produces a 40% emotional, 30% physiological, 20% neurological, and 10% rational responses). And the components of those configurations are likely to have fairly fuzzy borders, because they are greatly affected by our state of mind/body at the time of the experience. But when we experience a satisfying story, when a story has elicited a satisfactory configuration of responses, we know it. We say “That was a good story” or “That was fun” without trying to really take it apart and understand why. And a story’s marketing category does not affect how it manipulates our responses. Instead, it describes the conventions appropriate to correctly interpreting its plot. Put away your Northrup Frye. I’m talking about something much more essential than mimesis or myth. 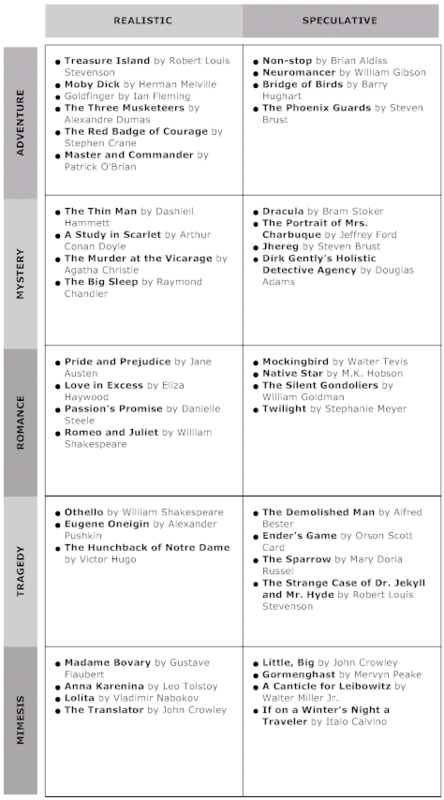 If we just focus on a story’s plot and how that plot is constructed, we find several different modes of storytelling. Each of these modes relies on a certain configuration of those responses I mentioned above. For example, an adventure story is going to produce a certain kind of physiological response. Our heart rate might increase, our breath might grow short, we might be eagerly looking to see how the hero will get out of a particular jam. But a mimetic (for the sake of simplicity, let’s call it a representative or slice-of-life) story is unlikely to produce that kind of response. Instead, it is more likely to be quieter, slower. These responses have nothing whatsoever to do with whether a story has fantastical elements or not. Consider two adventures: Alexandre Dumas’ The Three Musketeers and Steven Brust’s The Phoenix Guards . They make for an interesting comparison, in that the latter is explicitly modeled on the former. But while Dumas’ most famous work has no fantastical elements to speak of, Brust’s novel is replete with them. Yet both stories produce similar responses in the reader, particularly if we are familiar with both works. So if a story’s fantastical elements (or the lack thereof) has no bearing on the mode a story is told in, then why do some folks prefer speculative fiction over realistic fiction? I believe that fantastical storytelling has an inherent advantage over realistic storytelling. There are no boundaries on what we can do with it. If a concretized metaphor (*cough* the one ring *cough*) adds value to our story, then why not run with it? Just because it isn’t realistic does not mean such images or metaphors are valueless. Realistic storytelling is actually a subset of fantastical storytelling: by design, it chooses to limit its images and narrative devices to those which can be found in real life. If we love good storytelling, then it’s perfectly natural that we would love the speculative genres. Like Whitman, they contain multitudes. Every single realistic story, from Shakespeare to Joyce, can be presented using fantastical imagery. That a particular execution of a story remains realistic is merely the consequence of an authorial decision as to its ideal presentation. Yet despite the fact that good stories do not need fantastical devices to remain good stories, plenty of folks out there read exclusively in the fantastic genres. Why? If they can find equally enjoyable stories among the “realistic” shelves, why stick with SF/F/H? I suspect it is because of a positive feedback loop imprinted on our brains early on. When we first consciously encounter storytelling, we look for patterns. It’s a consequence of our highly-developed simian brains. So if in those formative years, we learn that science fiction, or fantasy, or horror is statistically more likely to produce a particular configuration of responses that satisfies us, we treat it like a drug. We learn to love it, and to equate that particular marketing category with the pleasure it produces. And then sometimes, we never stray beyond that gateway. This gate swings both ways, of course. The same holds true for many readers of realistic fiction, or for many movie-goers who never pick up a book. It’s all about the positive feedback loop that gets imprinted on our neurons at a formative age. I suspect (on the basis of absolutely zero neurological knowledge) that this imprinting can be changed as our experiences change us, but it remains a powerful driver of our experiences. I suspect the tough-to-pin-down “sense of wonder” is actually a consequence of this gateway drug. If we are adequately self-aware, we learn to recognize (through a meta-cognitive experience), the response we are seeking. That recognition produces that scintillating sense-of-wonder fans of SF/F/H use to justify our genre habit. Speaking for myself, I can elicit that same sense-of-wonder reading outside of genre (Patrick O’Brian’s books come to mind, as do Yasunari Kawabata’s). I don’t believe wonder is genre-specific, although the experience is statistically more common among the fantastic shelves. And this brings us to the core reason why the speculative genres are so popular: they are a marketing category that encompasses all of the basic modes of storytelling found in realistic fiction. You’ll notice there is no such marketing category as “realistic fiction”. If we want to balance “SF/F/H” we would need an equally broad “realistic fiction” category. But instead, the “realistic fiction” section is fragmented into literary fiction, thrillers, romance, mystery, historical fiction, etc. If you want to find a realistic story told in the romantic mode, well your odds are pretty small looking under literary fiction. If you want a piece of mimetic fiction that deepens your understanding of the human condition, you should probably avoid the thriller shelves. Yet all of these storytelling modes can be found side-by-side in the science fiction, fantasy, and horror section. Fans of genre fiction need never wander outside of those shelves to find stories that satisfy their every need. And that’s why, as a marketing category, it is so popular. It contains multitudes. And those increase the odds that a story from that marketing category will produce a satisfying response. Of course, much as I love fantastical fiction, I still think folks should read outside of their beloved genres every now and again. But if they don’t, well that’s fine, too: speculative fiction’s got a lot to love. What do you think? Why does speculative fiction push a lot of our buttons and keep our attention the way it does? Why does it produce such fervent loyalty on the part of readers and viewers? So in my brain, I had a great blog post all planned out for today. It was going to be a nice and meaty post about different schools of writing process, and the dangerous temptation of superstitious totemic twaddle that so many of us fall prey to. But then I went through my mail from last week, and found a review copy of Jonathan Case’s debut graphic novel Dear Creature . And then my plans went the way of all those of mice and men. I cannot stress enough how excellent this book is, as a work of sequential art, as a story, and as an exercise in writing. I didn’t even mean to start reading it: I intended to put it on my to-read shelves, and to get to it maybe sometime in the next couple of weeks. But somewhere in the twelve feet between opening the envelope on my kitchen table and putting it on a shelf in my library (probably because I “just took a peak” at the first couple of pages), Case’s story sucked me in like a whirlpool. Dear Creature is the literary, quirky, heart-warming, and deliciously pulpy love story (yeah, I know, right?) of an atomic sea mutant named Grue. Living in a sunken nuclear sub, and to the chagrin of a crustacean chorus, Grue is no longer content to devour lustful beach-going teenagers. With his eyes and heart opened by pages of Shakespeare’s plays found in soda bottles, the lonely sea monster naturally tries to seek out whoever has been sending out these messages. It’s tempting when reviewing a graphic novel to start with the art. After all, the art is intrinsic to a graphic novel’s storytelling. But what really set Dear Creature apart for me was the writing. While many people who write sequential art are uncomfortable drawing distinctions between comic books and graphic novels, I’m afraid I’ve never agreed with Douglas Wolk’s claim that the sole difference is their binding. A true graphic novel – like Dear Creature , or Gene Luen Yang’s Level Up – is paced and constructed very differently from a bound-up collection of serialized 24 – 32 page comic books. Most prose novels, whether we’re talking about Dickens, Calvino, or Ian Fleming, cannot be split up into neat episodes without losing some degree of their resonance or storytelling unity. But a graphic “novel” that began life as a series of smaller comic books, like Allan Moore’s Watchmen , Frank Miller’s The Dark Knight Returns , or Garth Ennis’ Preacher can never be more than the sum of its parts, however good those parts may be. That’s just the nature of the beast. But Dear Creature , while it is divided into chapters, coalesces by its very nature into a resonating, cathartic story that draws us in, makes us laugh, and satisfies us only when we have experienced its entirety. Case does not construct his individual chapters the way a comic book writer constructs particular issues: he constructs them the way a prose novelist constructs chapters, relying on the story’s over-arching flow, compelling characters, and emotional narrative to carry us along. Case builds his characters through a flawless union of art and dialog. Grue, his lovelorn atomic sea monster, speaks in iambic pentameter entirely oblivious to its idiosyncrasy in 1962 California. With all of the book’s focus on Shakespeare, it’s tempting to try to find models in the Bard. But really, I trace Grue’s antecedents more to Cervantes than Shakespeare. Grue is like a modern day Don Quixote, in that for him the high drama of Shakespeare has applicability to every facet of his contemporary life. And if it doesn’t? Well, then by God it should! Case captures this touching quixotic earnestness in Grue’s every pose, centering our attention on his larger-than-life actions whether dramatic or comedic. Grue is accompanied by a Greek crab chorus used to great comedic effect. If Aeschylus’ Oceanids in Prometheus Bound represent a “perfect audience’s” reactions to the Titan’s plight, then what do Case’s crabs represent? It’s not like they’re sympathetic to Grue’s concerns. Instead, they poke fun at the beleaguered monster and exhort him to return to feasting upon human flesh. And Grue’s Dulcinea del Toboso? Like Aldonza Lorenzo, the woman who captures Grue’s deep and soulful heart with torn pages of Shakespeare sent into the briny deep is not your stereotypical love interest. First, she’s crazy, as in violently agoraphobic. And she is old (well, middle-aged) in the same way that Aldonza is plain. But just as Quixote looks past the simple truth in the interests of his higher truth, so too Grue simply does not notice. The love that forms between a man-eating atomic sea monster and a middle-aged agoraphobe is poignant, touching, and tragic. Artistically, Dear Creature is equally clever. Case chose to draw it in a style that made me instantly think of Will Eisner’s The Spirit . Like Eisner, Case uses solid black shading to add depth to his panels, while relying on iconic lines to draw his heroes. This quasi-homage seemed most apparent and appropriate in the case of Henry Craw, a retiring policeman who particularly reminded me of an aging Denny Colt. By combining excellent character development with superlative dialog, and a heartfelt emotional arc, Case has written one of the best novels I have read in years. And yes, that is novels as opposed to graphic novels. Yet since this book is structured so much like a prose novel, and with characters and writing that clearly trace their lineage back to classic literature, it did raise a question as I was reading it: does Dear Creature need to be sequential art to tell its story? Similar love stories, characters, quirks, and pulpiness have all been captured in prose by other authors before, and in particular this book made me think of A. Lee Martinez’ great books. But what did Case gain through choosing to tell this story visually? I think the answer speaks to Case’s prodigious and multifaceted skills and talents: by writing Dear Creature as a graphic novel, Case was able to get out of his own way. The use of sequential art in this book obviates the need for exposition. By relying on the art to show us what is happening, the dialog is able to stand on its own and remind us of Shakespeare, Cervantes, and classic drama undiluted by descriptive text. Which makes the story tighter, and in some ways purer, than it would otherwise have been. I commend Jonathan Case for this excellent graphic novel. It is very rare to find a storyteller who is able to write something that is at once literary and meta-textual, while remaining touching and hilarious. To then combine that ear for dialog and prose with artistic talent is even rarer. If you enjoy sequential art, then hands down, you should pick up Dear Creature . And I think that it should be on everybody’s short-list for the Eisner award. I’ve been a fan of Bill Willingham’s writing for years. His work on Vertigo’s Fables ? Hands-down the best comic book writing out there. I’ve particularly appreciated the structure he brings to his sequential storytelling: sweeping, complex plots that more closely resemble epic fantasy than standard super-hero fare (most of which I can no longer stomach). Several months ago at BEA, I managed to snag a review copy of his new middle-grade fantasy novel Down the Mysterly River , which Tor Teen/Starscape just released a couple of weeks ago. Down the Mysterly River follows the adventures of a young boy named Max who wakes up in the woods one day with no recollection of how he got there. Thankfully, Max is a Boy Scout and so is better prepared for such situations than I ever could be. As he tries to figure out where he is and how he got there, he makes friends with a talking badger, a tyrannical tom cat, and a friendly bear. All four of them are in the same situation, and together they must figure out what brought them to this place. But they must do so while fleeing from the Blue Cutters, a band of sword-swinging fanatics who want to re-create our heroes according to their own ideas of what makes people good. Obviously, Max and his friends are not particularly interested in being forcibly molded. The book is generally structured as an adventure story, and blended with mystery. Our plucky band of heroes must sneak and fight their way free of the Blue Cutters while piecing together the mystery surrounding their appearance in this unfamiliar world. The book is written in omniscient third, but with a relatively narrow focus on Max. With his self-professed experience at detection, Max eagerly goes about solving the mystery and we are drawn into it in his wake. While Max may proceed with little fear, Willingham expertly uses ominous suggestions to raise tension for the reader. Within minutes of meeting Branderbrock the Badger, for example, we learn that he remembers his own death, suggesting that both he and Max are already dead. I found the contrasts between positive and negative to be the book’s strongest aspects, and such contrasts show up repeatedly in Willingham’s character development. While our four heroes are drawn sympathetically, three out of the four have darker (or at least more negative) sides: McTavish the Monster (the tom cat) self-identifies as evil and selfish, but evidences unswerving loyalty when put to the test. In many ways, he reminds me of Doli from The Book of Three : on the surface, brash and self-centered, but heroic nonetheless. Walden the Bear is portrayed as dull-witted and lazy, but is giving and capable of great violence when roused. Max, with his capacity for introspection, teeters on the edge of making certain choices that may align him with the Blue Cutters’ morality. His struggles with his own conscience and justification lend the book its moral depth. Of the four heroes, Branderbrock is the only one who does not have a dual nature or conflicting desires. Together, our adventurers are offset by the Blue Cutters, who are depicted with haughty brutality. They are vicious and cruel, and their implacability in particular makes them frightening villains. Willingham concretizes these contrasts in his battle scenes, where he does not shy away from violence. While I don’t think this weakens the book at all, I think it is particularly notable for its genre and intended audience. Most MG fiction – and even most YA – tends to steer clear of blood-in-the-mud battle scenes. And middle-grade heroes almost never kill human villains. Even in The Hunger Games , which is targeted towards a YA audience and is considered by many to be a particularly violent novel, Katniss Everdeen only directly kills one of the other twenty three tributes. But in Down the Mysterly River , intended for a younger audience, we not only watch our heroes become grievously wounded on several occasions, but we see the Blue Cutters torturing innocent animals, and watch Max actually kill one of the Blue Cutters. This violence is depicted in a matter-of-fact fashion, and though I was surprised to see a MG novel with this degree of it, I found that it did not draw away from the story. In some ways, the violence lends a visual dynamism to the book: reading along, I imagined sequential panels visualizing the action as if I were reading a comic. This kind of stylized violence brings excitement to a graphic medium, but in prose I found that its implausibility diminished its realism. Yes, the book is violent. But it is no more violent Adams’ Watership Down , the story of Robin Hood, or Brian Jacques’ Redwall series. Thematically, the violence was also treated seriously. Throughout, our heroes engage in violence defensively. They do not take the attack to the Blue Cutters: they are just trying to get away from people who are intent on torturing and killing them. And Willingham justifies our heroes’ violent response by showing us exactly how vile the Blue Cutters really are, and by making it clear that our heroes are significantly outnumbered. And, perhaps most significantly, he does not let our heroes off the hook: their actions have consequences, and Max is shown to struggle with his choices. That his actions to defend himself and his loved ones are justified in no way diminishes the poignancy of his guilty conscience. And, interestingly, the book seems to suggest that offensive action against the Blue Cutters is an adult right: one that twelve year-old Max is not ready to either understand or undertake. The world-building is well-executed. Willingham’s cosmology – which lies at the heart of the mystery – is particularly interesting and appealing, though to explain why would unravel the mystery Willingham painstakingly sets up. Readers of Fables will no doubt recognize certain archetypes that show up in his world-building, but they are put to a very different use in Down the Mysterly River . The characterization and how it ties into the world-building is also particularly well done, with non-human heroes who we can understand and believe in despite their fantastic natures. The writing itself is competent, but I found a number of areas where it could have been tightened. The first quarter of the book tends towards stilted descriptive sentences. At BEA, I asked Willingham about the difference between writing a prose novel and a comic script, and he pointed towards exposition. The book’s beginning clearly shows where Willingham struggled with this: his early descriptions tended to flow more like visual notation for an artist rather than descriptions of ongoing action. However, the text remains functional and his skilled characterization is able to overcome the exposition’s choppiness. And as the book’s plot accelerates, the flow improves and Willingham loses the stilted declarative style that predominated early on. By the book’s mid-point, sentences and paragraphs are flowing smoothly. The other weakness that stood out to me in the writing was an occasional tendency to over-write. Honestly, I see this as less of a failure on the part of Willingham’s writing as on the part of his editor’s line-editing: good MG/YA editors should know to look out for this and trim it out of the book before it ever goes into production. Yes, this is a book for children. But kids are more perceptive than we stodgy grown-ups like to give them credit for. Even ten year-olds don’t need to have a rhetorical question defined and explained for them: if they don’t know the word, then they’ll pick it up in context. I found this tendency most jarring when it occurred at the end of certain chapters, throwing off the rhythm and dramatic resonance of the chapter’s conclusion. Next time, I would hope such extraneous and unnecessary sentences were just cut: part of what makes great MG fiction great is that it challenges the reader. And kids are especially sensitive to condescension in their reading. Despite these weaknesses, I found Down the Mysterly River to be a fun adventure. The answers to Max’s mystery were robust, and the characterization and story arcs that Willingham takes us down are immensely satisfying. For parents who may be concerned about the violence: it’s handled well, and if you have concerns about it, read the book yourself first, and then decide if your kid is ready for it. There’s no universal rule. I found that the violence was tasteful and well-executed. At nine or ten I know that I would’ve enjoyed the book. Whether the same holds true for your kid, well, that’s your call. Grown-up fans of Willingham’s comic book writing will probably enjoy it, provided that they remember that it is not a Fables book. Comic book retailers – who I’ve heard had trouble selling Willingham’s earlier prose novel in the Fables universe – may find that Down the Mysterly River is a great transition book for kids who read books like Owly and might now be ready for more grown-up fare. I really enjoyed Willingham’s first foray into his own prose fiction, and I hope to see more books like this from him.